(Newser) – There's a line where a dope sound system crosses over into the realm of illegality, and it's probably somewhere around speaker number 40. 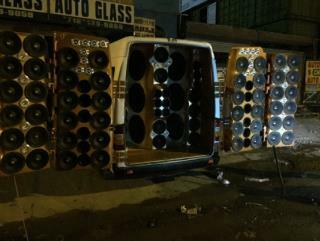 NBC New York reports police received multiple calls complaining about "exorbitantly loud" music coming from a white van a little before 11pm Saturday in Queens. The music was so loud, in fact, that one of those calls came from the bullpen at nearby Citi Field, where the Mets were taking on the Braves, according to AM New York. QNS reports the van has been an "ongoing issue" in the neighborhood, hosting "impromptu parties" with its incredibly loud music. Why not go out to an open area where you will not disturb a lot of people? This guy asks for trouble and will probably be deaf before long. There are legal limits to the decibels one can emit. These laws are on the books. The authorities claiming the system is illegal, no system is illegal. Yes prove it! Thats what Hillary said when she was caught by the FBI purchasing virgin blood with out a permit at the local DC petting zoo. It was only a misdemeanor ticket she received for riding the yard goats without her pants on. She told the local pd the goats refused to wear her pants.